Please welcome Sylvia Spruck Wrigley, today’s Guest Blogger. Sylvia is leading a project to create a submissions tracker and market research engine for writers called Submitomancy. The free level will allow all of us to track submissions and find markets in an easy, organized way. I asked her to tell us about one of the many special aspects of the paid level. The start-up is a crowd-funded effort – please join me in getting this project off the ground! Writing can be lonely work. When I started thinking about creating a one-stop-shop for manuscript and submitting process, I wondered if it could be used for motivation too. There are a lot of great resources for writers online and I really love the message boards and forums that I am a member of (too many). There are a many options for discussion and I don’t think that needs adding to. But there’s a basic solidarity in numbers that can be comforting. I feel really motivated by seeing Lee’s updates, especially over the past year when she’s been writing a flash story every week. I’d love to see constant updates from Lee for my own inspiration but I also know that keeping up a blog is hard work. The problem is, even though I’m not in the top tier, I know that I write a lot, I submit a lot and I get rejected a lot. If I post all my submissions, I worry that it sounds like I’m bragging. If I post all my rejections, I feel like I’m whining. I hate worrying about whether I’m dominating a forum by posting too much. I don’t want people to feel like they have to respond. I don’t want to bore my non-writerly friends with the minutia of my writing life. It seems likely that I’m not the only person that feels this way. And that’s what got me thinking. When I do exercise, I post my work-out on a fitness website. My friends on the website see what I’ve done and leave one-click messages of encouragement, which helps, in a small way, to make me want to go out and do it again. Whether the system calls them likes, +1, props or woots, the idea is the same. Someone has seen my effort and acknowledged it and that makes me smile. So how could that work from a writing point of view? First of all, I have to be able to add other users as my friends, which creates a private group exclusive to me. When I enter a new piece, I’ll be prompted to post it as a status update, either publicly or privately to my group of friends. They can quickly congratulate me but it also gives someone like Lee a chance to contact me if she wants to recommend a market that she thinks would be a good match. A status update showing my latest submission can build solidarity. And although rejections are never fun, sharing them with a select group of friends can help to ease the sting. The user tracking will also give you updates as you progress. 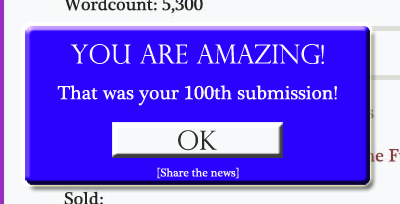 So you might get a pop-up window when you reach ten pieces out for consideration or when you’ve reached your 100th submission. The details of these milestones will be discussed with the Early Access users but the point is to help you see your progress and to give you the opportunity to share it. The important point here is that no update would ever happen automatically. My feeling is that no one wants to read an automated feed. So for every action you take that warrants an update, you’ll be asked if you would like to share it and whether you’d like that update to be private or public. My goal is to make it quick and easy to share and respond to progress updates so that we are all just a little bit less alone. That might not seem an obvious feature for a submission tracker, but it is one that is important to me. Right now, Submitomancy is just a dream. I’ve put together an Indiegogo campaign to work out whether there is enough interest in the writing community to move forward. If you think the world would be a better place if Submitomancy existed, then please support the Indiegogo campaign and tell your friends. This entry was posted in Guest Bloggers, Writer Resources and tagged great ideas, submissions, Submitomancy, Sylvia Spruck Wrigley, writers, Writers Resources, writing. Bookmark the permalink. Very interesting! Once I get to the stage of submitting and queries, rather than contests 🙂 , this looks like something that would be v helpful.